Many iPhone users are always faced with the challenge of clearing the history on their phone. For carriers of iPhone, majorly will have Skype installed on their gadgets. Because Skype has been found to be one of the world’s best instant messaging application, that can be used across multiple platforms and devices. Hence, the reason why many iPhone users get so much attached to Skype. Much has Skype can be a good application for instant messaging for iPhone users. The chat history recorded could be a clog in the wheels of iPhone carriers, either for personal reasons or technical hitch. Here arise the need of how to delete Skype chat history from iPhone to make your iPhone perform optimally. Many see this as a process too difficult to execute. I will work you through the steps to be taken seamlessly in a bid to get those irritating Skype chat history off your iPhone. There are cases when you want to selectively delete the Skype history from your iPhone. I will guide you through that with causing any harm or damage to your device. While on your home screen, click on the Skype icon and log into your account. The first screen that appears after log in takes you to the Recent Tab that opens a list of recent and previous history. Here you need to choose the chat history you want to delete, by pressing and holding down on that specific conversation. The next option that slide out is either to Cancel or Delete. So tap Delete and the chat is gone. However, for so many users of iPhone they still find it difficult to permanently delete Skype histories from iPhone. My research led me to veritable software that comes handy to handle that. I present to you iMyFone Umate Pro or iMyFone Umate Pro for Mac. This software is easy to use by anybody without being a Tech geek, all you need do is to have it on your iPhone and worry no more about the menace of Skype chat history. 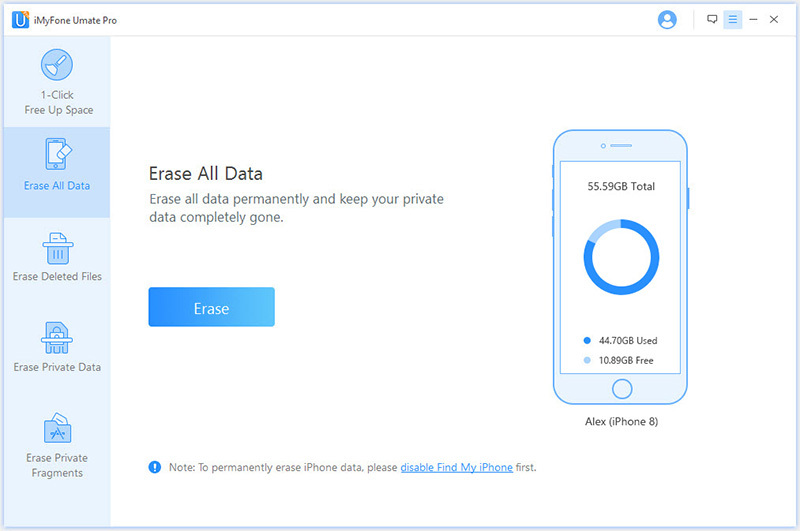 The iMyFone Umate Pro has been widely accepted by iPhone users as a tool for permanently erasing private iPhone data. Basically, if you choose to get the iMyFone Umate Pro for your iPhone, these are the steps of using it to erase iPhone data. Step 1: Download and install the iMyFone Umate Pro software to your Personal Computer (PC),. Run it and connect your iOS device via a cable. Step 2: Before you deleting or erasing any file or device applications. Have a look at what the program can do for your: 1-Click Free Up Space, Erase All Data, Erase Deleted Files, Erase Private Data. For permanently erasing iPhone Skype histories, you should choose the “Erase All Data” mode. 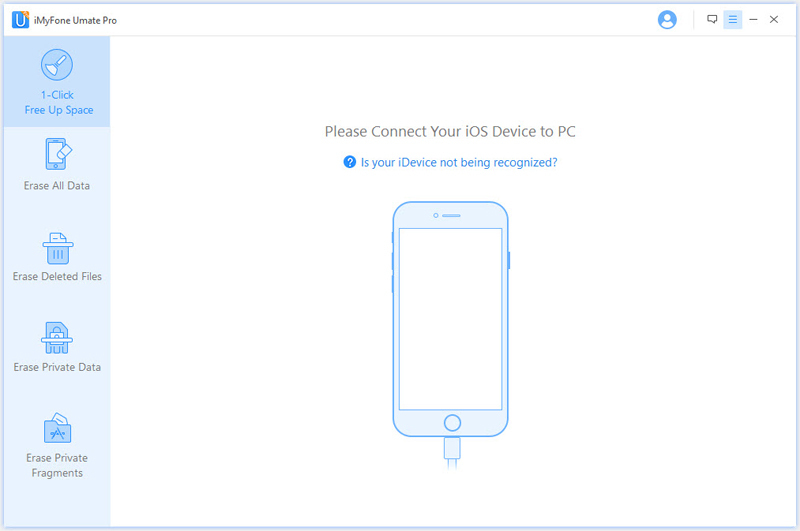 Step 3: Click on "Erase" button to permanently erase data from your iPhone/iPad/iPod Touch. With all of these steps been applied, your personal skype data will be totally erased. What’s more, you are sure of a better performance and enough space on your iPhone device. If just want to fix the problem of iPhone memory full, the function of “1-Click Free Up Space” is recommended. The program will Scan your iPhone for a full space-saving analysis. This software has a collection of more than 25 analyzing technologies, and it as the capacity of scanning and analyzing data immediately. 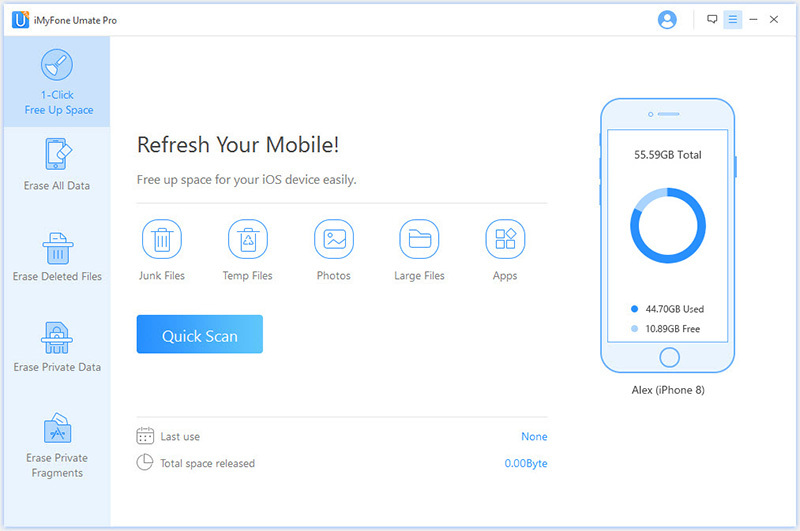 Click on "Quick Scan" for a full space-saving analysis and discover how much space can be retrieved by cleaning up junk files, clearing temporary files, compressing photos, deleting bigger files and removing unwanted applications. At the end of the cleaning exercise, you will see how much space has been saved and how much more can be released by other functions as the below interface displays.